InSANE@Singapore. : Eat Laroo La! Eat Laroo La! That would be Singlish for devouring an Assamese delight! They say some things always stay with you. 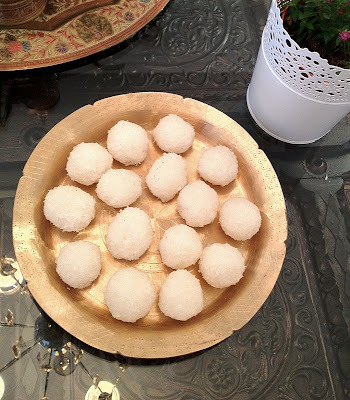 For me, one of them is the lingering taste of the Assamese laroo, a traditional sweet made of good old coconut and lots of sugar (which doesn't make it all that good.) This simple delight is one sacred gastronomic vice of mine! Far away in noodle land, the tasty devil sits in one corner of my head and keeps waking me up on weird occasions. Once, in the middle of the night, it came rolling in my head like a fresh ball of snow. The thing just kept bouncing off the walls of my brain cells! It was like reverse, sweet vertigo. I couldn’t do much but reluctantly jibe along and ruminate sweet savour times. It didn’t help though. To realise my laroo dreams, many a time I’ve tried to match the good old sweet with local ingredients. I'm not complaining, but what do you expect from a pack of dry stale coconut flakes and processed sugar, trying their luck to mould into a luscious laroo. All I got was a gummy flaky substance. If nothing else, it would have made excellent coconut flavoured adhesive for my craft work. Another time I got a coconut, the inside of which was unusually fragile and thin. This made it impossibly stubborn to blend in the whole spiritual concoction. Then came last week. Accompanied with fresh determination, I went straight to the local wet market. By some fleeting good coconut testing instinct, I finally got a decent thing to go home with me and unfold the 'raaz’. I’ve made the sweet before and it turned out fine, and sometimes even great. So, it wasn't the lack of talent that didn't result in delicacy. I really hoped so. I consoled myself with another chance to fulfill this craving through my own making. It was the best Laroo I have ever made in my life. My dear husband was one delighted testimony; he devoured the devils, one by one till a pair was left. My daughter did the honor of finishing the couple off in a jiffy. Ha! I could have pinned a rose on my nose! I guess the 4th ingredient did justice to the genuine love I have for this food being. My doting father would have been very proud of me. I made ‘em just the way Khuri does back in Guwahati! Voila Laroo! ooh La La Laroo! Mix all the ingredients in a pan. Sauté till you get a nice sticky form. Remove it and immediately make small balls. Do take care of the heat though. Make sure you wash your hands really well before digging into the sticky coconut sugar blend. Don't bother moisturizing; you’ll get loads of it when you're done! The pleasant smell and sumptuous look of the laroos is so tantalising, you'll want to wolf all of them down at once!